The U.S. has 306,662 square feet per person. 1,840 square feet of that is roads. 65,340 square feet feeds that person. A few hundred provides him with places to live and work. The rest is wild land and poor land. Solar roads are complete nonsense because there is no reason at all to conserve that space. There is reason to try to find ways to make them cheaper and not more expensive than they already are. Trying to justify them by saying things like semiconductors are a great way to save money on rock only makes them look worse. KarenRei wrote: At present they're substantially more expensive. In the long run, I seriously doubt that. Yes, they need to be able to take varying compressive loads, and they have a wear surface. But they also don't need mounts, foundations, and face no meaningful wind loads (adhesive bound to the substrate). Yeah, I think they'll be more expensive in the end. But I suspect that in the end, the cost over non-road-panels will be about the same as the money saved by not having to build the road traction surface that you'd have otherwise had to build. Who knows? *We need data*. It really doesn't work like that. If you manage to create a solar panel that can be installed as a road surface as cheaply as you claim, you can use the exact same technology to install even cheaper solar panels next to the road; no need for foundations, as there would be no loads on the panels, and the panels themselves would be cheaper as they wouldn't have need for the "road surface" qualities. Or you could just roll the material on rooftops, again cheaper than the road surface. The same way if your hypothetical solar pavement is comparative to the cost of asphalt, you could use that same technology to pave roads again even cheaper, if you just left the electronics out of it. You just can't handwave the inherent problems of solar roads away by saying "technology will make it cheaper", as that same technology can be applied to other uses that don't have the inherent problems of solar roads. The only advantage of solar roads is land use, and that's not really a problem that needs to be solved. Your own example picture nicely demonstrates this. KarenRei wrote: Should they be given a chance to try to prove it? IMHO, absolutely. That's quite useful data, for not that much money. Let's see where it goes. Mikeski wrote: Someone needs to tell them that their substrate material can't be white, at least. Lane-departure sensors and (potentially) self-driving cars will go nuts with those extra white lines everywhere. 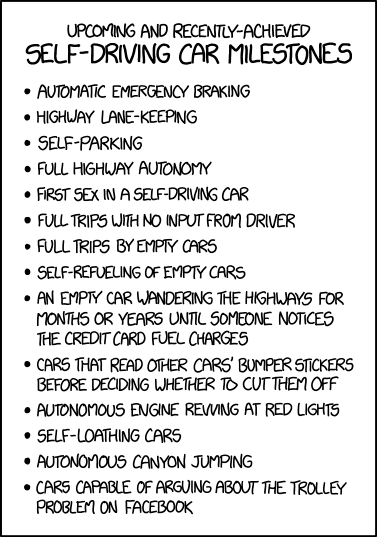 One of the many reasons I don't like self driving cars yet. They can't handle so many conditions that human drivers can work out. Some near by roadworks have been badly marked and caused multiple problems for humans. I dread to think what a self driving car would have made of it. Sorry, engineering doesn't work like that. What you're describing is otherwise known as "debris flying into traffic at high speeds during a windstorm". On my land I have stacks of plywood ready for a home construction project, in a semi-sheltered area (but on very windy land). So I weighed the stacks down with concrete blocks - a couple hundred kilograms per stack. Not good enough - first storm comes, off the top piece and concrete goes, and then the rest blows into the canyon - every last piece. To keep the timber stacks from blowing away, I had to bind them all (effectively into giant blocks of wood) with steel wire, all the wire bundles connected with wires, and all of this with corner anchor points of fish crates full of rock. Flat objects are *superb* at taking flight in wind. Just a little bit of wind gets under, and they're gone. They have to be anchored very well. Or you could just roll the material on rooftops, again cheaper than the road surface. LOL again. Yes, it's so easy to just drive up onto a rooftop, and back down, and roofs totally love to have paving equipment driven on them, and they're totally designed to have random objects adhered to them (all in the same manner, regardless of roof surface), and they're totally in long straight lines, and you totally don't need individual engineering analyses and about a hundred other issues. Rooftop solar is as expensive as it is because each project is small scale and custom. And then you fail to get a solar farm. The whole issue is that you get a two-for-one. The base of the road is both a road base and panel foundation. The panels are both panels and a traction surface. It's build once, not twice, to get two entirely separate things would individually cost significant money. You just can't handwave the inherent problems of solar roads away by saying "technology will make it cheaper"
Explain the fundamental barrier against solar road hardware decreasing as R&D and scale of production rises. Explain the fundamental barrier against solar road soft costs decreasing as mechanical solar road paving systems replace manual ones, and processes become refined and standardized. Of course they'll drop. That doesn't mean that they will work out to the economics that they need - but acting like a first-generation prototype road is the final cost is just patently absurd. KarenRei wrote: Sorry, engineering doesn't work like that. What you're describing is otherwise known as "debris flying into traffic at high speeds during a windstorm". So you anchor it down with steel spikes every couple meters. No biggie. Your road surface has the exact same problem; the "foundation" of a road is basically gravel, you can't just glue stuff on that. Or otherwise you'd need to first make some sort of solid (and heavy) layer on the road and then glue your panels on that; hardly cheaper than just using asphalt. The only reason why solar farms need foundations is that you normally want maximal efficiency out of your panels. That means good alignment and perhaps some kind of cooling system, which means the panels can't just lay on the ground. Also current panels need a lot of wiring, so having some kind of structure underneath is a good thing. But if you are willing to accept large losses on efficiency (i.e. your panels are dirt cheap) and have some kind of roll-on instant all-in-one package deal, the equation changes completely. As for rooftop installation, if you have a solar panel material that can be rolled out of a truck, it can be rolled out by hand, too. Sure, maybe it's more expensive than rolling it out on a field, but still way more sensible than rolling it on a road surface. Solar roads only makes sense if you have solar panels that cost nothing. The only problem with that is that when you reach that point, you're going to have more than enough installed solar capacity to make the solar roads redundant. While I am very skeptical the solar road will be feasible for various stated above, I have some hope that the research into road materials may contribute to better roads or a "smart" road that could improve the safety and/or efficiency of autonomous cars. For example a "smart" road could emit a detectable signals (e.g. NFC, radio, electromagnetic, a specific type of light, or something else) that autonomous cars can detect more reliably than cameras can detect a physical painted lane, particularly in obstructing conditions like snow, rain, dirt, leaves, etc. "Smart" roads interfacing with "smart" cars may one day be able to re-route traffic on the fly for more efficient road use. Of course, this is theoretical now, but small steps in many disciplines to make it possible. It's easier to install panels off the road than on them. Any justification is just a made up excuse that could be done better off the road. Any off road problem is worse on road and easier to fix off road. That's it. The one reason is space saving which is not necessary at all. Foundations and everything else in the universe you could possibly mention are inexpensive compared to the panels themselves, whose costs greatly increase when you do anything to slash their efficiency. Such as increased dust and incorrect angle. Cutting costs is to try to make semiconductors compete with rock. Succeed there and we have dirt cheap clean energy that far exceeds our needs. Then however we deploy it is just splitting hairs in the Utopia that follows. Solar itself isn't a significant contributer to green energy. Wind and hydro are. It's kind of nice for roofs and remote areas because it cuts distribution and middle men. I actually couldn't sleep last night and was looking this. Based on what they have so far I think it is possible, but in a limited capacity. It will be most valuable as a driver assist safety feature reducing accidents and not true self driving. Full no steering wheel will be limited to certain areas but still a useful taxi and delivery option which is extremely valuable. These things are already being done on expensive cars and test vehicles. I think limiting their scope will be used rather than more expensive roads. At least until they're mainstream. There are advantages. Besides the land use which is most definitely a problem that needs to be solved in many areas, there's the fact that it effectively replaces surfacing and resurfacing the road. If you build a traditional solar farm you need to spend money on normal road maintenance AND maintaining the solar farm. If you build a solar road surface you ONLY need to spend money maintaining that surface, saving whatever you would spend to resurface the road normally. The same goes for regular maintenance and even cleaning. In fact, a solar road would be MUCH easier to clean than a solar farm because you can just run a (perhaps modified) street sweeper down it, which would double as cleaning the road as well. It's entirely feasible that with added costs being low enough you could save money in the long run compared to building a separate standing farm. ericgrau wrote: It's easier to install panels off the road than on them. That's not the critical question though. The critical question is: "Is it easier to build the road AND install panels off the road than it is to build the road with the panels on them?" While the answer is likely no, spending a little bit of money to find out is not insane. And the worst case is likely that we get more durable and more easily cleaned solar panels for use in more typical installations. The best case is we find some way to install about 20 million acres of solar panels easily and cheaply. And yes, Solar is a singificant contributor to renewable energy. Yes, for optimum use, it needs to be combined with energy storage or with load balancing applications. However, even if you just use it in combination with natural gas power plants, you can significantly reduce non-renewable energy use compared with 100% natural gas approaches. And of course, hydro is readily applicable for peaker use as well. Mikeski wrote: Would you ever consider eating food after you dropped it on a road? ...maybe it's because I've been on starvation rations for a few weeks, but my answer is yes. Wee Red Bird wrote: Just don't fit them in areas where some joker will lift the tiles for fun or to sell for profit. Which would be just about anywhere. Around here, what it would be replacing is "the road is damaged, add another layer of asphalt." Older roads here are almost a whole meter above the sidewalks, driveways, and gutters beside them due to repeated "repair". A solution where you replace tiles instead wouldn't have that problem. Based on the photos, the feature size on the extra lines is small enough to easily be ignored by a well-designed system. I don't know a lot about current lane departure sensor implementations, but I do know that a simple "white pixel = lane boundary" sensor wouldn't work well enough to be useful. Solra Bizna wrote: Around here, what it would be replacing is "the road is damaged, add another layer of asphalt." Older roads here are almost a whole meter above the sidewalks, driveways, and gutters beside them due to repeated "repair". A solution where you replace tiles instead wouldn't have that problem. A solution where your highway authority repairs the road properly would also not have that problem. The "add another layer" approach is only ever going to be temporary; if the underlying material is damaged, that will propagate upwards into whatever you put on top. Do it too much and you get headroom issues, too. A solution where your highway authority repairs the road properly would also not have that problem. The "add another layer" approach is only ever going to be temporary; if the underlying material is damaged, that will propagate upwards into whatever you put on top. HES is correct. If roads are really a meter above original from layers of "repairs" there's no reason to trust the managing person/agency will properly maintain/replace road tiles either. Where I am they always scrape off the old layer of asphalt and re-use it, which sounds cheaper. Of course I have no idea how that would translate with solar strips. The other possibility is that they manage to pass off the road repairs to a company in charge of the solar panels. I'm not going to think about the logistics or deals involved in that, but it's a distinct possibility. A lump of concrete is sitting in the bar, when a lump of black asphalt wanders in. The concrete takes exception to his presence, gets in his personal space, acts all aggressive, and the asphalt leaves in a hurry, all emotional. "Look concrete, you're an old friend and a very good customer and and that's why I tolerate your particular taste in clientele," says the bartender. "If you don't like asphalt, ok, this is a no-asphalt bar. But please let me deal with that my own way. I don't want them more upset than necessary." The next day, the concrete sees another lump of black tarmac wander in. He looks at the bartender, meaningfully, who has a quiet word that ends up with the tarmac upping sticks, looking a bit miffed. "See, told you that you could leave it to me, old friend." The next day, in walks a lump of coloured asphalt. The concrete looks at the bartender. The bartender does nothig. The concrete nudges the bartender, he says "No way, not this time". The concrete stands up, but the bartender leans over and rests a hand on him. "And don't you try nothing either. I've heard about this one, and you don't want to get him angry. Word on the street says he's a total cycle-path!" They are widely used for traffic signalling here in the Netherlands as well. Asphalt for the thoroughfares and connecting roads, bricks for local destination roads. Probably why the machine was developed here, there is a huge continuing market. There's lots of empty space by my house where it would be easier to put solar panels, yet we're putting them on the roof regardless. Not clever, not funny, not a good comic.